Yangsi Rinpoche gave these teachings to a group of Western students over a month-long period a few years ago in Dharamsala, India. While having the full training of a Tibetan scholar, Rinpoche uses Western metaphors and demonstrates an appreciation for the Western mind. 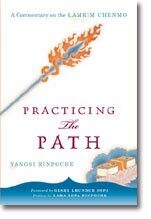 The text is an excellent resource for those studying and meditating on the Lamrim, the steps on the path to enlightenment. 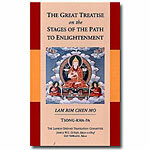 The Lamrim Chenmo is a comprehensive overview of the entire path to enlightenment, superimposing the essential principles of renunciation, bodhicitta, and the pure view of emptiness. It is unique in combining scriptural authority and perfect logic in order to clarify all doubts on the path. The author's deep knowledge of the traditional teachings and his ability to elucidate them in contemporary language and form provide a unique opportunity for readers to refine their understanding and develop their practice. Paperback, 2003 edition, 533 pages.